I was delighted to attend the ‘Biz Club’ at The Falcon Hotel, Uppingham yesterday. Interesting business people were gathered for lunch. 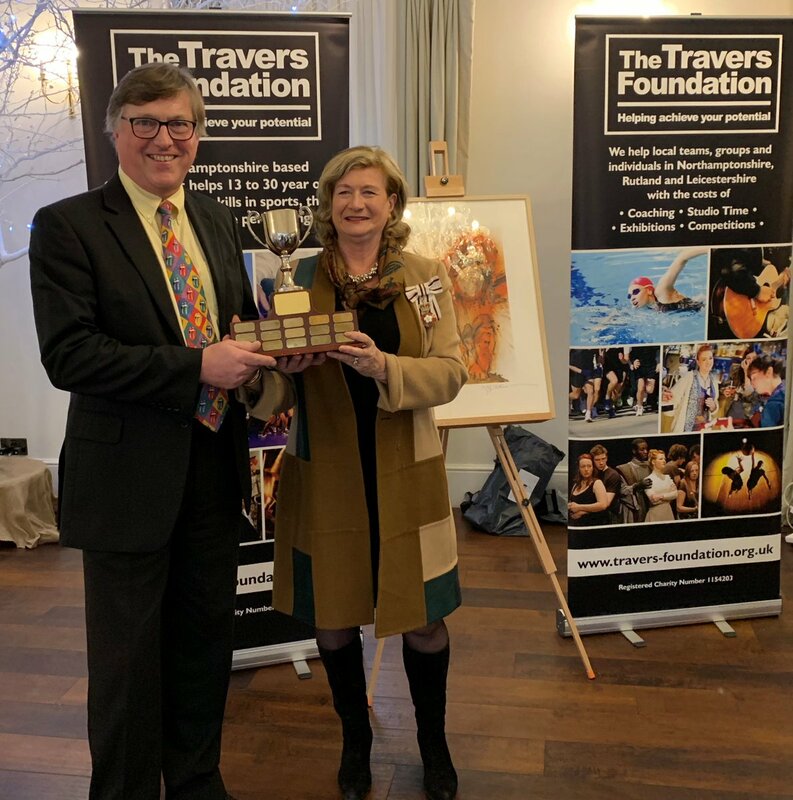 It was a privilege to be HM The Queen’s representative and present the Biz Club award to Terry Forsey of the Travers Foundation – a charity that helps 13 -30 year olds in creative arts & sports. November 15th was Presentation Evening at UCC Rutland. We celebrated excellent results for GCSEs. 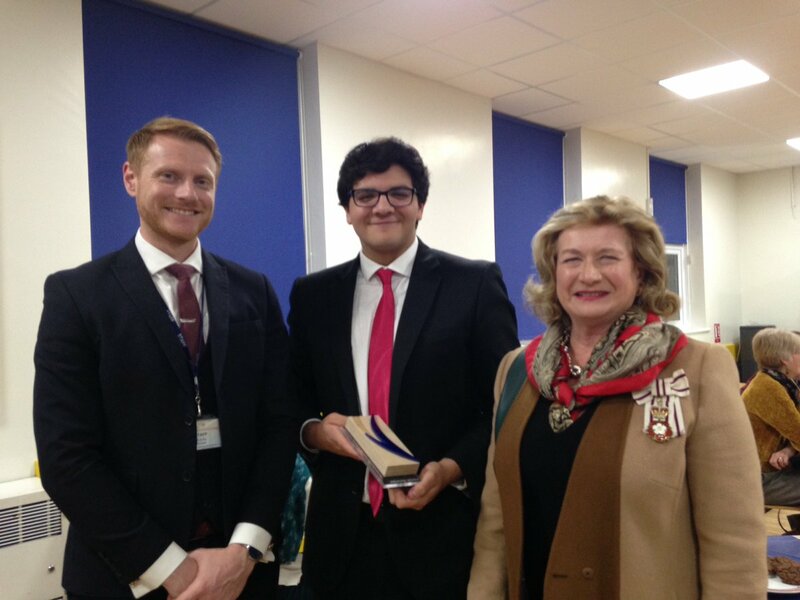 I was pleased that the Lord-Lieutenant’s award for Outstanding Achievement went to Joseph Banerjee for his string of top grades. Congratulations to all & good wishes for happy futures. Joseph is now at Harington School. 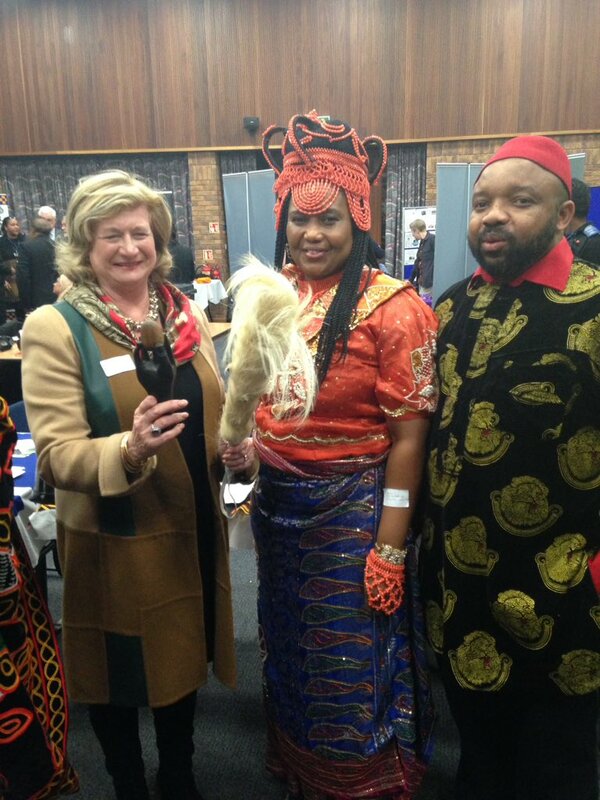 At this event I was glad to meet African origin British who want to build understanding with police & the community, so that there is better appreciation of their law abiding culture. I loved the ‘egg in hand’ symbol – if authority is too firm the egg gets crushed, but if too light the egg is dropped & broken. 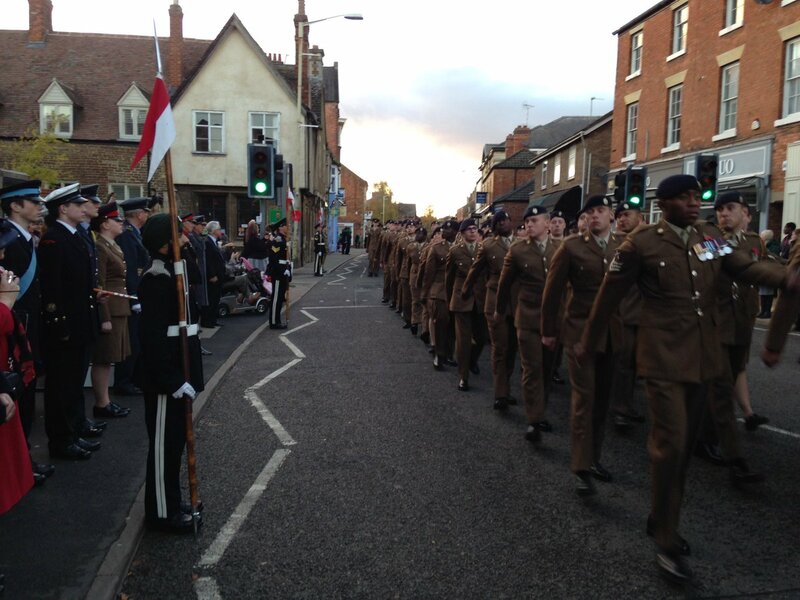 I think something very special happened on Armistice Day in Rutland. All across the county churches were packed with people of all ages remembering the lessons of WW1 – I hope it happened right across Britain. Let’s try & live happy lives that benefit others in remembrance. 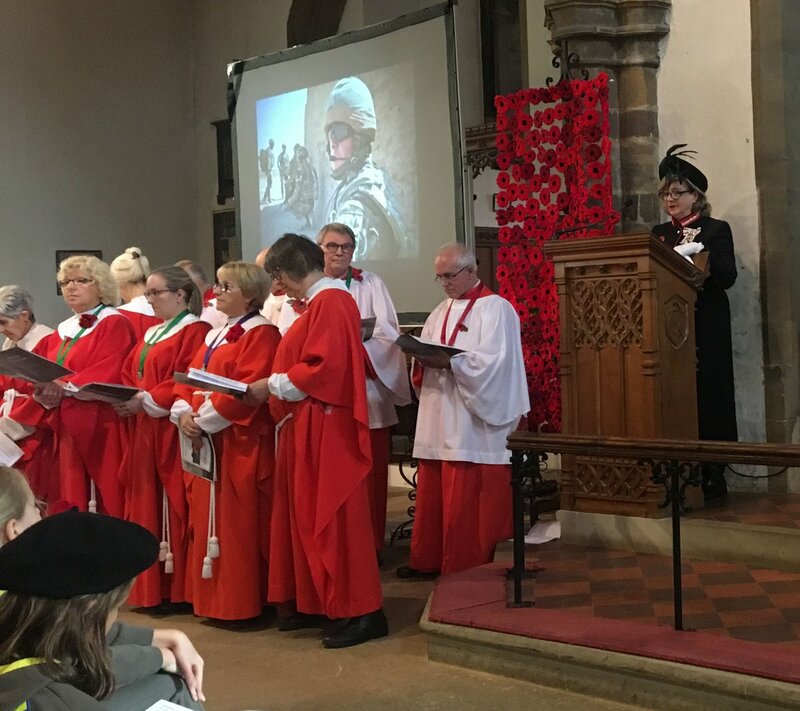 There was standing room only for the service of Remembrance Day 2018 at St Peter & St Paul, Uppingham. People of all ages were present including many youngsters, meaning that ‘we will remember them’ is true. Thanks to Rev. Rachel Watts, Richard Cole and choir for a moving service and wreath-laying. At the service we discovered that Uppingham has five women leaders! 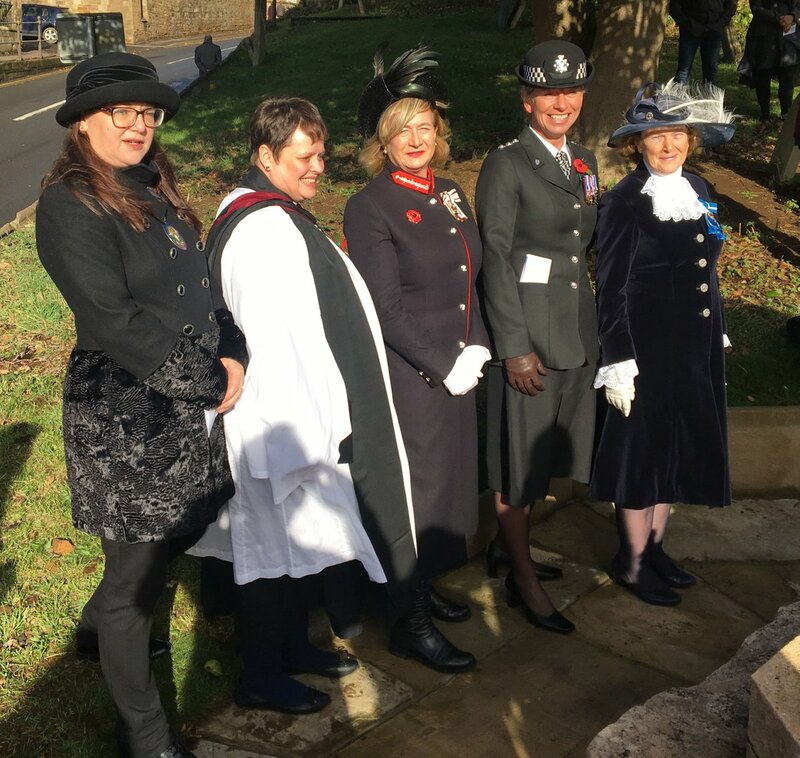 From left to right below, Mayor Miranda Jones, Vicar Rachel Watts, me, Commander of Rutland Police Louise Cordiner and High Sheriff Sue Jarrom! 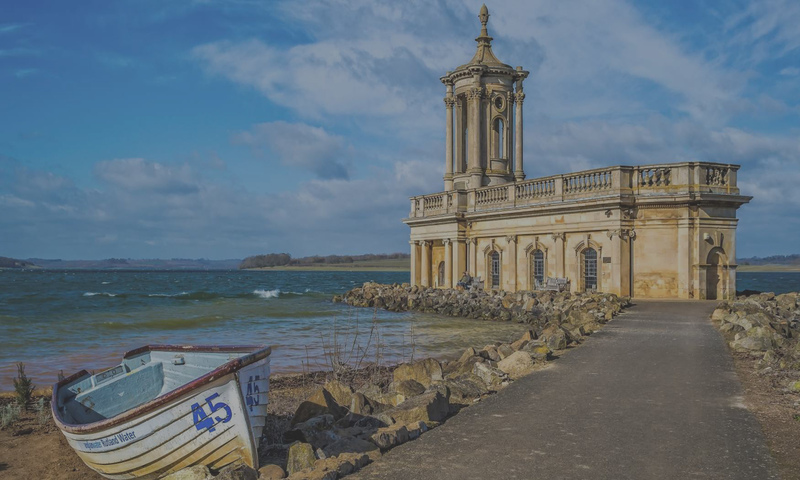 Historic for Rutland! How highly appropriate for the centenary of women’s suffrage. All are shown below gathered at Uppingham’s war memorial for the wreath-laying. 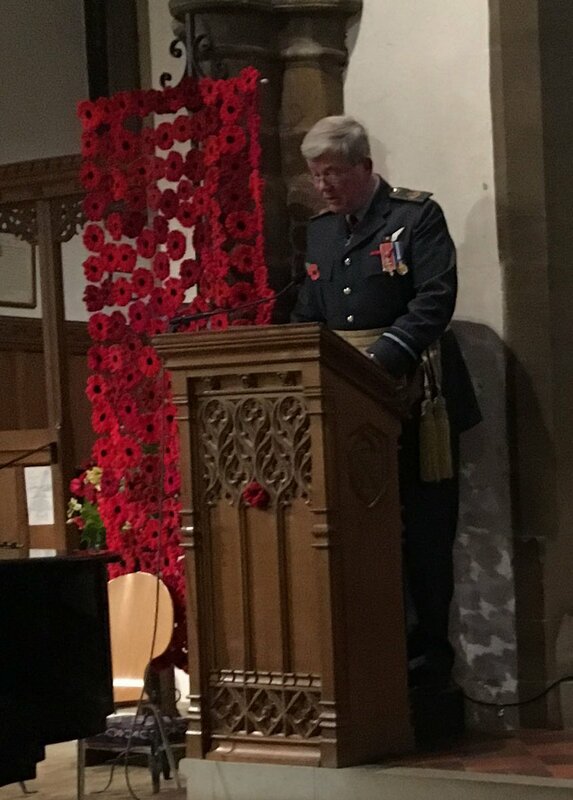 I attended a remarkable concert in Uppingham Church on the eve of the Centennial Armistice. 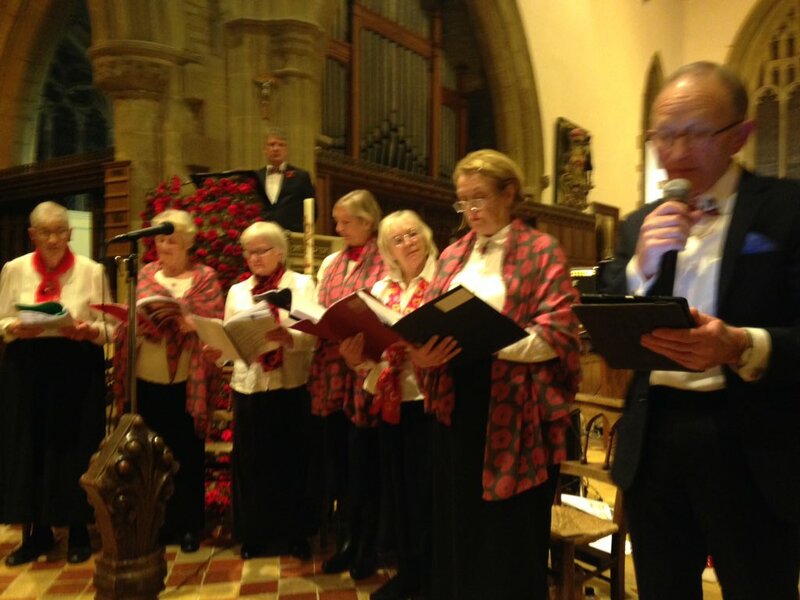 We heard the Military Wives Choir, Uppingham Choral Society, poetry readings. Leicestershire Northamptonshire and Rutland Cadets put on a magnificent display with their corps of drums. 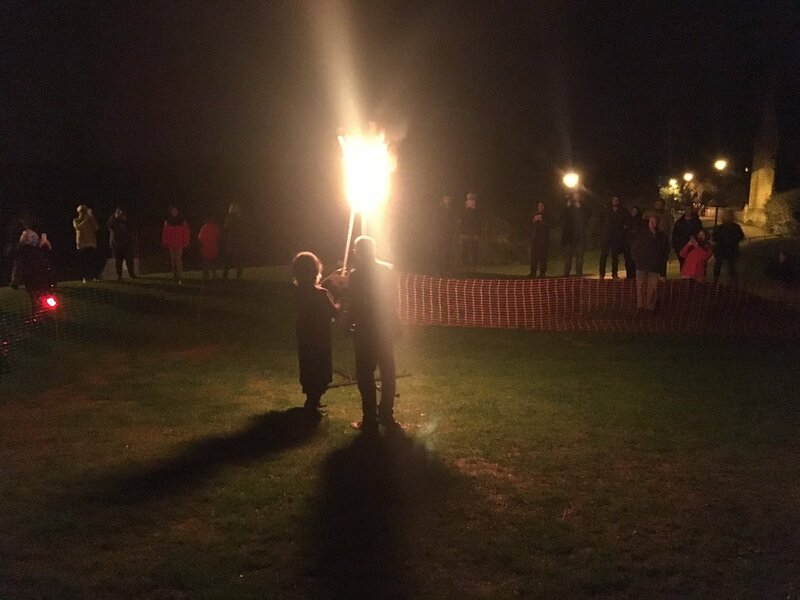 Pipers gave a preview of the planned lament at dawn. Well done all organisers and participants. £1500 was raised for military charities. 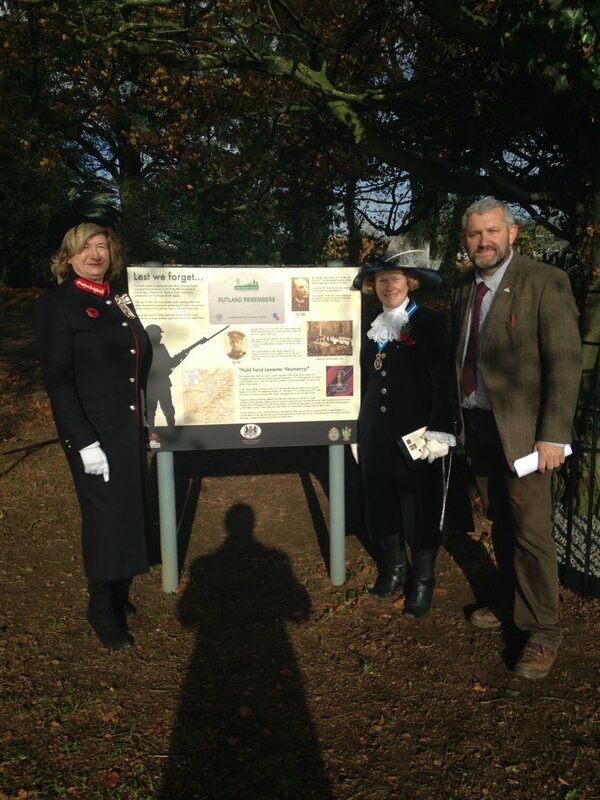 Rutland now has its own Centenary Field, a green space for everyone to enjoy in Oakham. A great way of commemorating WW1. 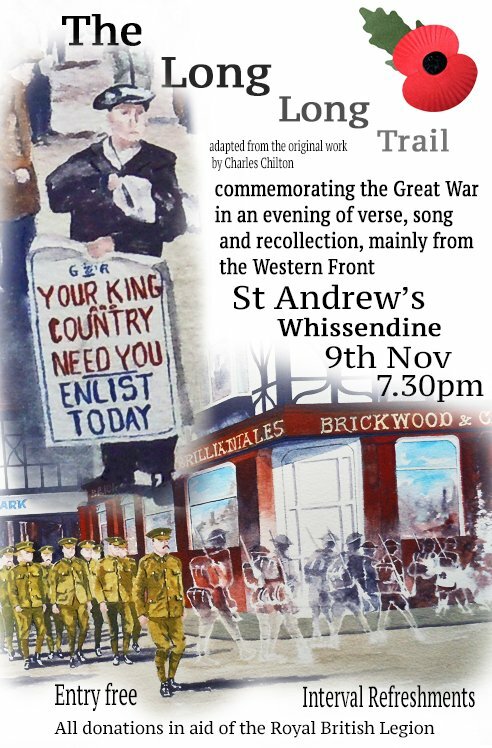 Congratulations for a deeply moving & informative concert & readings covering the course of World War 1; The Long, Long Trail in St Andrew’s Church, Whissendine. Very thought provoking. Thanks to all involved. I am so looking forward to the varied and beautiful events organised to celebrate this centennial Armistice in Rutland. My own weekend kicks off with music in my own village, Whissendine, at 7.30pm prompt in our beautiful ‘village cathedral’, St Andrew’s Church. Come and join me! 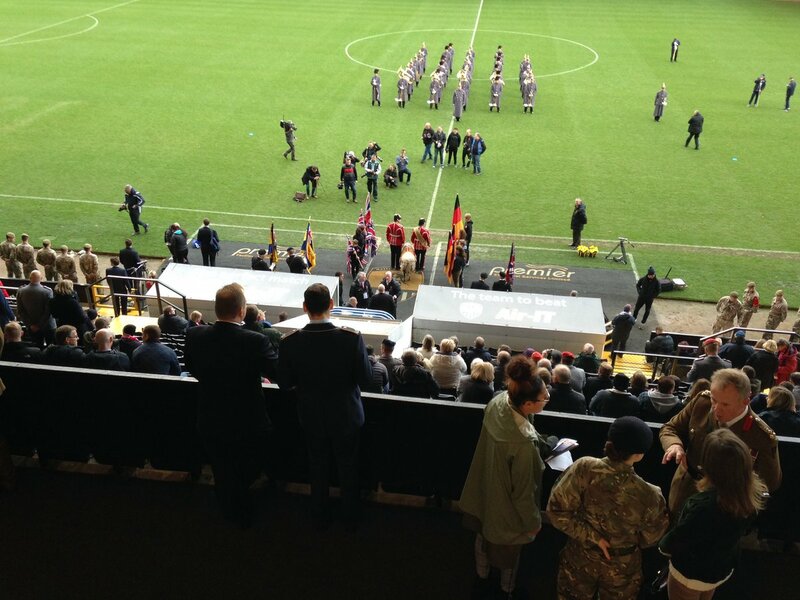 Great excitement at the Games of Remembrance 2018; 7,000 young people (and some a bit older) are here at the Notts County FC football ground for a women’s football match between English & German teams! Game on!! Now friends & allies, we all remember them.